Porcini mushroom or Boletus edulis is a very popular Italian mushroom that is often used on many Italian dishes because of its exquisite taste. It’s very big in size and it’s one of the most delicious mushrooms out there. It was first discovered by the French botanist Pierre Bulliard in 1782 and still bears its original name. This delicious mushroom contains pores along the outer surface of the cap. Ranging in size from one to ten inches in width, porcini mushrooms have still not been able to be cultivated commercially, which greatly limits world supply. The porcini mushroom is known as a meaty mushroom with a rich taste and woodsy flavor. Outside of Europe and gourmet markets, you will typically only find porcini’s in their dry form. This mushroom is very healthy and has a great source of protein, copper, potassium, zinc, selenium and B vitamins. These mushrooms are good source of dietary fiber and saturated and unsaturated fat are low in amount. It also has vitamin B9 full of Folate which is an important vitamin for liver function. Also has Vitamin B12, or folic acid, which helps to preserve neurological function and DNA synthesis. It has vital role in the health of red blood cells. The nervous system relies on vitamin B12 for proper function as well. It’s also full of Dietary Fiber which stimulates digestion and peristalsis, helping to relieve indigestion and constipation problems. Because it’s hard to find these mushroom on the market the best way to get them is growing them on our own. 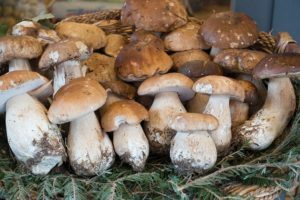 So here are a few easy steps on how to grow porcini mushrooms. The first thing you will need is a cardboard. Then you have to cut the cardboard so it is at least 2 feet in height and 3 feet in width. Make sure to use corrugated cardboard which is thicker than regular cardboard. You should also be able to see the layer of ribbed paper inside, providing air pockets. You then have to soak the cardboard in water. The cardboard is ready when it is pliable enough to bend or roll. After that the cardboard will be soft enough to be separated. Then you have to separate the cardboard. When wet, the cardboard will peel apart into two pieces equally. You have to make sure you don’t wet the cardboard so much that every piece of it peels off. Getting a corrugated cardboard is easy you can find them in most stores. You can also find them in paper mills or stores and most retailers with anything to do with paper. Also most new products come in a corrugated cardboard so they won’t be hard to find. There are also many online stores where you can find corrugated cardboard with ease like papermart, amazon etc. Next you have to get the porcini mushroom spore which will be discussed next. Mushroom reproduces using spores. They are the most important aspects of growing porcini mushrooms. Different mushrooms have different types of spore. Make sure first that you know which mushroom you are going to get spore from And depending upon the cap of the mushroom different mushrooms release different amounts of spores. It’s best to use gill mushrooms as it’s the most easiest to get spores from. Although difficult but with some proper experimentation, all types can be harvested. But you can also buy the spores in the market. And there are many websites online that sells spores specifically which shouldn’t be hard to find. But if you still want to save money you can harvest your own spore and here’s how. First you need to understand the method of how to collect it.The first thing you have to do is make a spore print. If you’re wondering what a spore print is it’s actually very simple. Making spore prints is done often by mycologists to recognize and identify fungus. They basically use the texture, color shape and texture to identify the different types of spores of different mushrooms. This is done to identify the mushrooms without the use of microscope. It’s a method that can be used to grow your own mushroom without buying them at the stores. This can be used on pizza or on other things. You can also use a syringe which will be discussed later but to harvest mushroom spores first you will need an edible porcini mushroom. Although this mushrooms are not too difficult to find. You need to be sure to pick a proper and mature mushroom. Also check and make sure the gills (if it’s another mushroom) or in this case of porcini tubes are OK and can be used properly. After that you need to gather a white paper piece and also don’t forget to collect a black paper as well. Then you also need to collect a glass container as well so it can be used on the mushroom. You may be wondering why two colored papers, that’s because the spores are often light colored and sometimes they are the opposite dark color. If both color is used it’ll help you determine the color of the spore if it’s not light or dark. First place the white paper on the side of the black one. After that remember to remove.The stem of the porcini mushroom carefully, and then upend it or in simple words turn it upside down. Remember to put the cap spore side of the mushroom onto the two pieces of papers, half of it will be on the white paper and the other half will be on the black one. Remember you need to cover the mushroom in a glass container which will stop it from dying. You have to leave it covered for a night and onto the next day you will see that the spores have dropped to the paper from the cap.If it’s needed spray it with a fixative or a hairspray although it’s not a must. This can also be done in a glass plate if a cool spore print is needed for hanging. But since we need the spores for growing our own mushroom we need to spread the spores on a ready soil container that has decomposing manure or compost. The time table for emerging depends on the type of mushroom. And also the environment plays a big part in this as well. You have to remember that most if not all fungi likes warm environment with a day/night cycle. Now we will discuss spore syringe.A spore syringe is often used for research by dropping spore and water into a slide and then viewing them with a microscope. Or it is also used to inoculate sterile substrates with different kinds of mushroom spores. You can usually buy this syringes online and they are sterile. But for saving cost and home gardening spore print is the easiest and probably the best option to go with. Especially for growing porcini mushrooms. After you have your spore you need to inoculate it with sawdust. In this step you have to coat the cardboard with the ribbed side of the wet cardboard with the sawdust inoculated with porcini mushroom spores, you have to do it using a putty knife. After you’ve done that roll it into a tube and fold the end towards the middle of the tube. Then cover and secure it with a duct tape to keep it rolled. Then you need to place the mushroom spores in a location with an average temperature between 60 and 64 degrees Fahrenheit, and a 95-percent humidity level. Also remember to keep the cardboard moist by spraying water with a spray bottle. This is the easiest part. Once the mushrooms are grown you have to harvest them. If you are lucky you may get fruit multiple times.